violet_thistle- I really like your pouches, especially the lining fabric you chose. It goes very well with the yarn. Thanks! It very helpful to have an over abundant quilter's stash. I've made several more since they are soooo fast and easy to whip up. Ripping the zippers out of my son's outgrown pants and shorts take more time than making the change purses! I do have a couple of pairs of pants that I'm probably going to take the zipper out of. Now, to find nice yarn (maybe wool so I can felt them) and inside fabric. I have a small stash, so hopefully I will only have to buy some yarn (and use a coupon for it!). Awesome! I love it and want to make one too! I didn't read all the posts, so I don't know if anyone mentioned this already (probably did), but you could also felt the circles, (if they are wool) to really make sure nothing will fall or poke out. Fab easy, useful project! 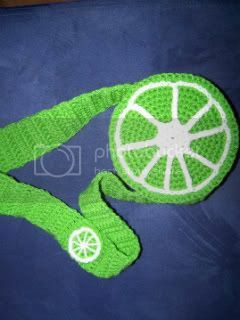 Perfect to teach my wee cousin to crochet and she should be really pleased with the end results as she can used the purse afterwards! Sooo cute! My family is doing a frugal/green Christmas this year so we're scrounging around to find simple & fun gifts to make. This one is perfect for all the ladies on our list, from pre-teens to Grandmas! I love the idea. Also about using pants that someone has outgrown. I have a three year old and lately he's growing like a weed.